American rabbi; born in London April 7, 1863. He was educated in London, and when only eighteen traveled in Africa as interpreter for a French legation. He was severely wounded during the Zulu war, while assisting in the repulse of an attack by savages. Proceeding to Jamaica, British West Indies, he became rabbi of Kingston (1884-85), and then of Woodville, Miss., in the United States (1885-88). In 1888 he succeeded the Rev. Joseph Silverman as rabbi of Congregation B'nai Israel, Galveston, Texas, which position he still occupies (1902). He is librarian of the Texas Historical Society and a member of the executive council of the American Jewish Historical Society, to both of which he has made historical contributions. He has made most careful researches into the history of the Jews in Texas. 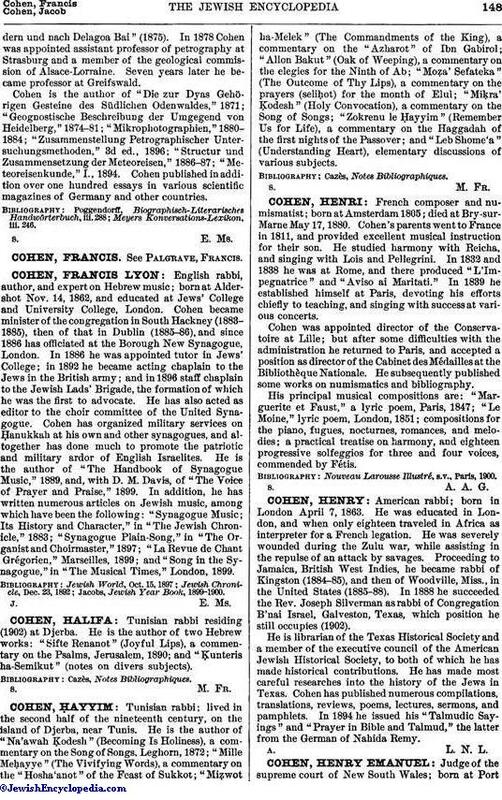 Cohen has published numerous compilations, translations, reviews, poems, lectures, sermons, and pamphlets. In 1894 he issued his "Talmudic Sayings" and "Prayer in Bible and Talmud," the latter from the German of Nahida Remy.